Offaly’s Cian Donoghue (right) and Eoghan Collins of Clare. 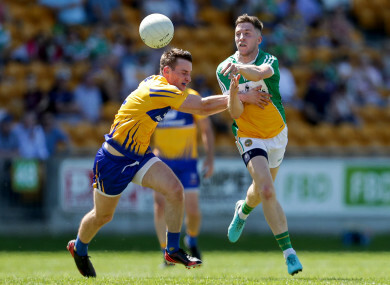 FOUR POINTS FROM the bench on a searing hot afternoon in Tullamore proved crucial for Clare as they edged out Offaly to secure their place as the eighth team into Monday morning’s All Ireland qualifier round three pot. Scorers for Offaly: Rúairí McNamee 1-2, Bernard Allen 0-5f, Johnny Moloney 0-4, Alan Mulhall 1-0 (pen), Anton Sullivan 0-3. Scorers for Clare: Jamie Malone 1-4, Eoin Cleary 0-6 (0-2f), Ciarán Malone & Gearóid O’Brien 0-2 each, Cian O’Dea, David Tubridy, Pearse Lillis, Gavin Cooney, Kevin Harnett 0-1 each. Email “Clare finish strongest in Tullamore to seal spot in round 3 of All-Ireland qualifiers”. Feedback on “Clare finish strongest in Tullamore to seal spot in round 3 of All-Ireland qualifiers”.